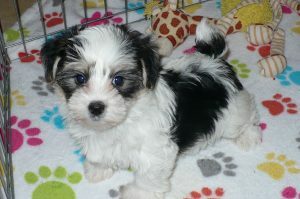 The Morkie is a cross between a purebred Yorkshire terrier and a purebred Maltese. This crossbreed originated in the United States. In addition, Morkies can be bred with each other. The Morkie hybrid is not recognized by the American Kennel Club as a “bona fide” breed. Although commonly called a Morkie, this breed can be called a Morkshire Terrier, since the Maltese was for a time also called a terrier (even though it is not). Morkie appearance varies widely, some expressing more of a Yorkshire terrier appearance and some more of a Maltese look. They are a small breed dog, typically weighing between 4–15 lb (1.8–6.8 kg). Common coat colors are: Black, brown, and white. The coat is usually long and soft. Morkie ears can be pointed, like that of a Yorkie, or floppy, like that of a Maltese.